lian goodall, author of Photographing Greatness: the Story of Karsh, has an article about Karsh, Prime Minister King and the first Canadian citizenship ceremony appearing in the June/July issue of The Wayback Times www.waybacktimes.com. She will be speaking about Karsh and Prime Minister King at 1pm on Sat. July 4th, 2009 at Woodside National Historic Site, Kitchener, 538 Wellington St. North. In addition, lian is moving to Picton on July 11th. She's excited that she will be living there and exploring Prince Edward County for the next year. On Thursday, June 18th, at the Picton Library, Peggy Dymond Leavey gave a presentation to a Grade 5 class from Queen Elizabeth Public School. They were a delightful group, who didn't mind walking to the library in the rain TWICE! There was a miscommunication about the time and they showed up both morning and afternoon. They got it right the second time. Their teacher had been reading Treasure at Turtle Lake to the class, and they were happy to discover that the book Peggy was reading from, Trouble at Turtle Narrows, was actually a sequel. Bernda Chapman visited Natalie Shorkey's Grade two/three class at Churchill Public School in Ottawa on June 2, 2009. 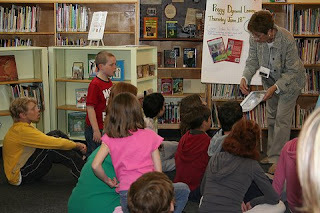 Two other classes joined in to hear Brenda talk about mysteries and read from Trail of Secrets. On June 2nd, Peggy Dymond Leavey was one of the guest panelists discussing children's literature in Cobourg, ON before a meeting of the Retired Teachers of Ontario, District 30. In the photo, left to right: authors Caley Fiddick, Ted Staunton, Richard Scrimger, Linda Hutsell-Manning, Peggy Dymond Leavey and illustrator, Brenda Clark.